What You Think You Know About Healthy Eating May Be Keeping You Overweight and Exhausted! Oh my goodness – nutrition and diet information is everywhere! The “calories in, calories out” philosophy (i.e. how much you eat) is being drowned out with research on other factors that may be just as important, if not more so. Don’t get me wrong limiting calories, carbs or fat can certainly help you lose weight but that’s simply not the only factor for long-term weight loss and maximum energy for everyone. Ideally, you need a varied diet full of nutrient-dense and minimally-processed foods (i.e. fewer “packaged” “ready-to-eat” foods). This simple concept is paramount for weight loss, energy, and overall health and wellness. Healthy fats and oils (never “hydrogenated” ones). There is a reason some fatty acids are called “essential” – you need them as building blocks for your hormones and brain as well as to be able to absorb essential fat-soluble vitamins from your uber-healthy salads. Use extra virgin olive oil and coconut oil, eat your organic egg yolks, and get grass-fed meats when possible. You don’t need to overdo it here. Just make sure you’re getting some high-quality fats at every meal. 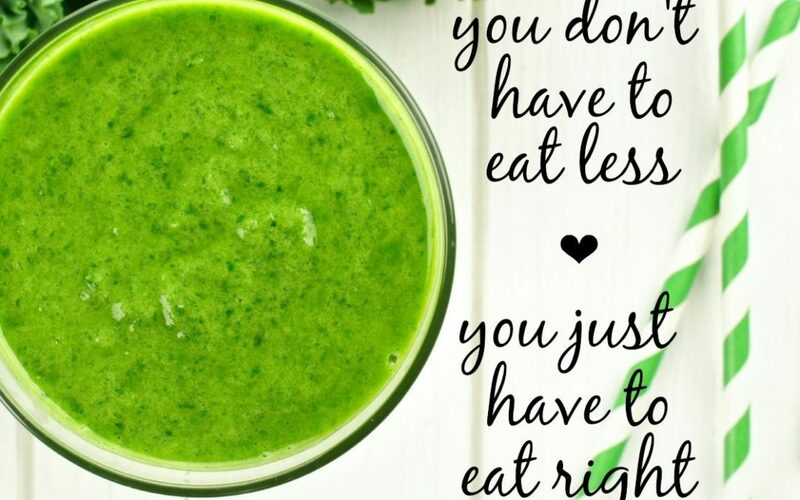 Smoothies can be healthy and a fabulously easy and tasty way to get in some fruits and veggies (hello leafy greens!) but drinking too much food can contribute to a weight problem and feelings of sluggishness. Beware of concentrated fruit juices which will spike your blood sugar and cause a subsequent “crash” of energy. A properly made smoothie is a great as a meal replacement as it should contain protein, fiber and healthy fats which will help keep your blood sugar stable and fuel your metabolism. Just don’t gulp it down too fast. Here is a recipe for one of my favorite smoothies – I have some variation of this most mornings for breakfast. Tip: Smoothies are the ultimate recipe for making substitutions. Try swapping different greens, fruit or seeds to match your preference. A lot of people like the creaminess that comes from adding some frozen banana or ½ an avocado. Bonus: Chia and flax seeds not only have fiber and essential omega-3 fatty acids but they contain all of the essential amino acids from protein. Do You Know How Good You Can Feel? What you put ON, not just IN, your body matters!